God has blessed a powerful gift that none other species on this planet has ever been gifted only to homo-sapiens and that's the power to speak. What one speaks has the ability to change the world itself. Choose them wisely! 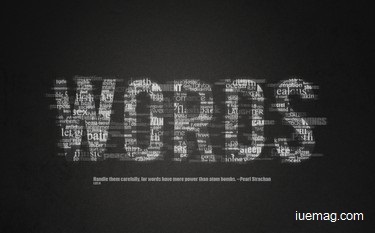 "Words" are weapons which are exceptionally the most powerful force available to humanity. We can choose to use this force effectively with words of encouragement or, catastrophically using words of desperation. Words have the ability and energy to empower, to help, to heal or cure, to obstruct, to damage, to distress, to embarrass, and to showcase humility. We are what our thoughts have made us. So, take care about what you think. Words are secondary while thoughts live for long. They travel far. Think twice before you speak, because, sometimes your words and their influence will plant a seed of either success or failure in the mind of the other person. When we express our gratitude we must never forget that the highest appreciation is not in terms of usage of absolute words, but we need to live by them too. Sometimes, someone’s speech might be false and full of art, while someone might just murmur the natural language of heart. When the opponent speaks those words might create negative energy but they show our reality and the side of us which we have never faced before. Most of the people are facing such things but don’t understand it unless someone tells them. Power of words should be used for good purpose of others and self. Beautiful thoughts are made up of Beautiful words. One word has the capacity to connect two people. Attractive words might not always be True, and True words might not always be delightful. Any facts, figures or references stated here are made by the author & don't reflect the endorsement of iU at all times unless otherwise drafted by official staff at iU. This article was first published here on 23rd May 2015.